Update 9/20/14: The volume is slated for release in the spring 2015 catalog. We’ve also received a copy of the cover–check it out. Techno-Orientalism: Imagining Asia in Speculative Fiction, History, and Media. Rutgers University Press, Spring 2015. What will the future look like? To judge from many speculative fiction films and books, from Blade Runner to Cloud Atlas, the future will be full of cities that resemble Tokyo, Hong Kong, and Shanghai, and it will be populated mainly by cold, unfeeling citizens who act like robots. Techno-Orientalism investigates the phenomenon of imagining Asia and Asians in hypo- or hyper-technological terms in literary, cinematic, and new media representations, while critically examining the stereotype of Asians as both technologically advanced and intellectually primitive, in dire need of Western consciousness-raising. The collection’s fourteen original essays trace the discourse of techno-orientalism across a wide array of media, from radio serials to cyberpunk novels, from Sax Rohmer’s Dr. Fu Manchu to Firefly. Applying a variety of theoretical, historical, and interpretive approaches, the contributors consider techno-orientalism a truly global phenomenon. In part, they tackle the key question of how these stereotypes serve to both express and assuage Western anxieties about Asia’s growing cultural influence and economic dominance. Yet the book also examines artists who have appropriated techno-orientalist tropes in order to critique racist and imperialist attitudes. 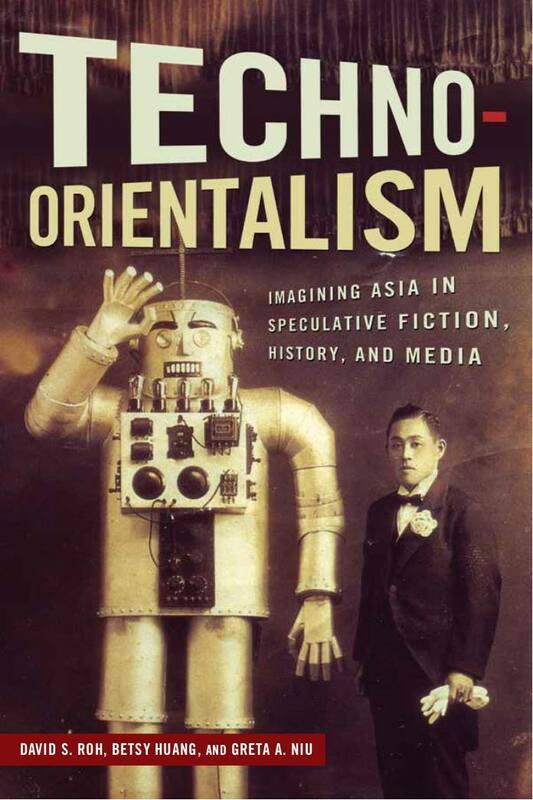 Techno-Orientalism is the first collection to define and critically analyze a phenomenon that pervades both science fiction and real-world news coverage of Asia. With essays on subjects ranging from wartime rhetoric of race and technology to science fiction by contemporary Asian American writers to the cultural implications of Korean gamers, this volume offers innovative perspectives and broadens conventional discussions in Asian American Cultural studies. DAVID S. ROH is an assistant professor of American literature and digital humanities at Old Dominion University. He is the author of Illegal Literature: Toward a Disruptive Creativity (2015). BETSY HUANG is an associate professor of English and chief officer of Diversity and Inclusion at Clark University. She is the author of Contesting Genres in Contemporary Asian American Fiction (2010). GRETA AI-YU NIU earned her Ph.D. in English from Duke University and has taught at SUNY Brockport, University of Rochester, and St. John Fisher College. Her research has appeared in National Women Studies Association Journal, Continuum, and Quarterly Review of Film & Video. I’m excited to officially announce that our edited volume, Techno-Orientalism, has been picked up by Rutgers University Press for publication. It’s been a long two years from conception to fruition, but thanks to my co-editors and our contributors, it’s gone by quickly without any of the pitfalls or quagmires normally associated with editing special collections.